These high quality apartments, built in 2012, are all situated in the Les Crozats area, close to the centre of Avoriaz and enjoy direct access to and from the slopes. Guests can take advantage of the superb facilities, including a steam room, sauna and gym (pay locally) within the complex, and Wi-Fi in the reception area (pay locally). There is also a pre-bookable '7-Dinner' option taken in one of the local restaurants which includes a 3 course evening meal. We update Les Crozats Apartments's details often, but facilities do change. e.g. some extras listed by the supplier as "free" or included might only be for the first time you use them, or for one time per party, then charged for further use. If any specific feature is essential to your holiday, make sure you ask us to confirm the details of it before you book your holiday. Portes du Soleil: €225. Ask for a quote when booking Les Crozats Apartments. 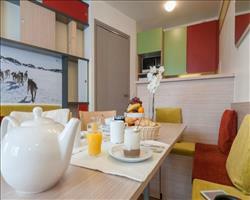 Residence Antares Avoriaz France, Folkestone Eurotunnel 28th March. Residence Saskia ... Avoriaz France, Folkestone Eurotunnel 21st March. 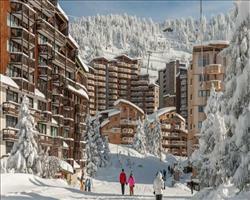 Residence Atria C... Avoriaz France, Folkestone Eurotunnel 21st March. 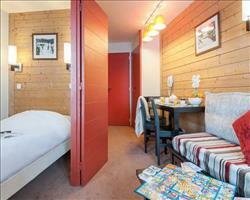 Residence Electra Avoriaz France, Folkestone Eurotunnel 28th March. 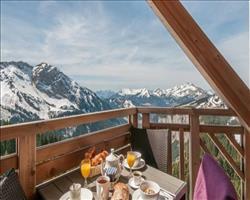 Residence L'Amara Avoriaz France, Folkestone Eurotunnel 28th March. The apartments were very good, nicely finished with enough room for the 4 of us (one room had 3 beds and I was in the living room). They’re well located, not too far to the village and you could basically snowboard in and out. You have to go down to the village for food shops via 3 sets of escalators, provided they were working (2/3 worked for us). "Preferred to previous Avoriaz apts"
We stayed in Avoriaz a couple of years previously in a couple of apartments that weren’t so good because they were very noisy. These ones were better, a good size, well equipped and nice and modern. We’re already familiar with the resort and how it’s quite quirky in terms of architecture, so we were expecting that anyway. For us the location was good as they’re outside the main pub drag which makes them quiet. There are escalators to take you into town or you could ski – there wasn’t any walking that you couldn’t handle if you were skiing anyway. The only thing in terms of the whole holiday was the transfer – the bus drops you on the outskirts and then you’re loaded onto snow cats which is a bit of a faff, especially with children.